“This galaxy is famous because it’s beautiful and very close to us, and because of what’s happening inside it–it’s quite extraordinary.” The Sculptor Galaxy has an enormous halo of gas, dust and stars, which had not been observed before at frequencies below 300 MHz. The halo originates from galactic “fountains” caused by star formation in the disk and a super-wind coming from the galaxy’s core. Astronomers have used a radio telescope in outback Western Australia to see the halo of a nearby starburst galaxy in unprecedented detail. A starburst galaxy is a galaxy experiencing a period of intense star formation and this one, known as NGC 253 or the Sculptor Galaxy, is approximately 11.5 million light-years from Earth. “We’re very fortunate to have such a great example of a starburst galaxy in our own cosmic backyard–it’s like having a galaxy-sized laboratory on hand to conduct experiments and test our theories,” said Dr Kapinska. “It’s remarkable how easily the MWA detected the diffuse halo, we managed it with just an hour of observing as the galaxy passed overhead,” she said. 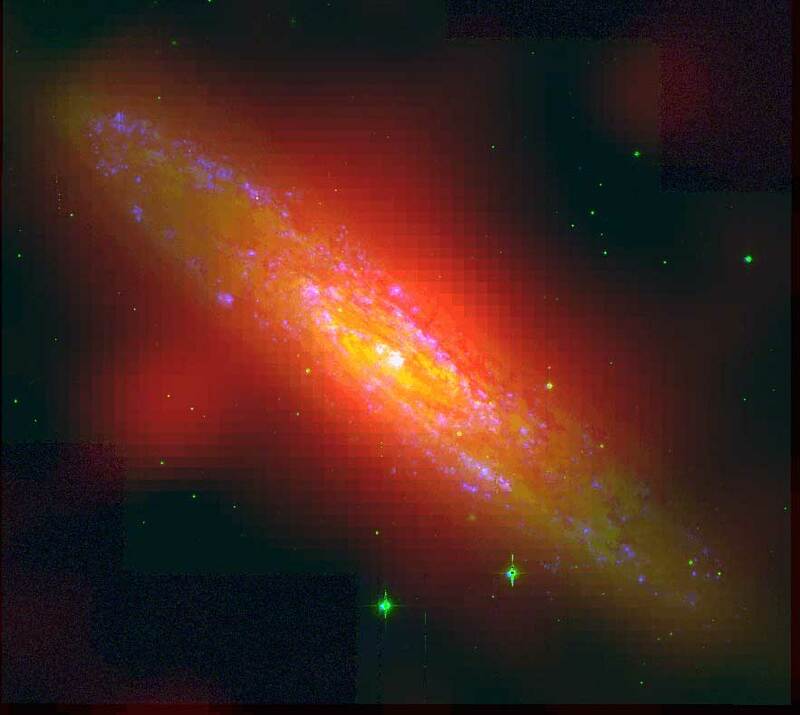 The image at the top of the page shows NGC253 in optical (green; SINGG Survey) and radio (red; GLEAM) wavelengths. The H-alpha line emission, which indicates regions of active star formation, is highlighted in blue. Image Credits: A.D. Kapinska, G. Meurer. ICRAR/UWA/CAASTRO.